Hello everyone! March is here, and Spring is not quite in the air... but, the hope of Spring is definitely in the air! Come to think of it, this may be the first year that we hunt for Easter eggs in two feet of snow! This month is especially exciting for Richard and I. 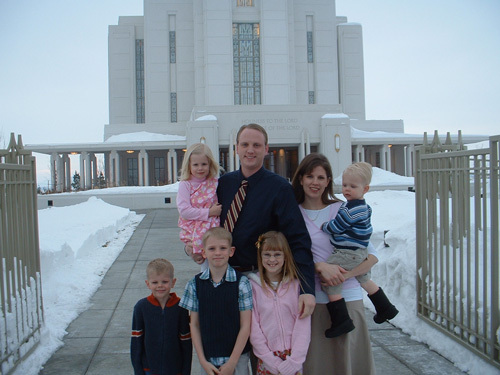 Ten years ago on March 7, we were married in the Idaho Falls Temple. I have included a special 10 year anniversary page that has pictures of then and now, and our engagement story. I am somewhat surprised at how NOT long ago it seems, yet how much has changed since then. (Including our appearance.) I guess that is a sign that we really are aging, but we try not to think about that part. 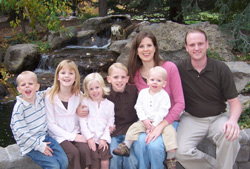 March 26, 2008 from "Jenni Warner"
Oh how I miss the Fergusons! It's hard to even think about it. Love you guys! March 24, 2008 from "Kelli Marshall"
March 22, 2008 from "maren layton"
March 5, 2008 from "Cyril & Maxine Burt"
Congratulations on your 10th anniversary! How could you two have five children and still look like a bride and groom? We are so proud of you and your family. The picture in front of the temple is very special. Thanks for being such a wonderful part of our family. Granddad & Grandma Burt. March 4, 2008 from "KaraLyn Ferguson"
March 4, 2008 from "Kim Vehar"
March 4, 2008 from "Alison Ferguson"
March 4, 2008 from "Hal G. Ferguson"
"I have no greater joy than to hear that my children walk in truth. . . . Beloved, follow not that which is evil, but that which is good. He that doeth good is of God: but he that doeth evil hath not seen God (3 Jn 4:3,11). March 3, 2008 from "Dixie Burt"